figures from the Lord of the Rings movies. LOTR has never gone out of fashion, and with the movies now seen as classics there will be intense interest in a LOTR series. This first lot of releases brings us Frodo, Samwise and Gandalf from the heroic side, and Nazgul, Saruman and a great 6” Balrog on the side of evil. We hope to see a very long, ongoing, schedule of releases which will cover the fellowship, their allies and all the bad guys too. 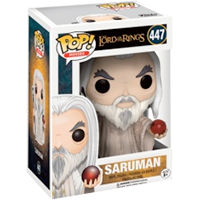 The Saruman POP! vinyl figure stands around 9cm tall.